On April 19, 2017, during the second period of the extra time of the second leg of the Champions League quarter-final match between Real Madrid and Bayern Munchen, Cristiano Ronaldo scored his hundredth UEFA Champions League goal (which was also his third goal of the night). any part of the head, body or feet is nearer to the opponents’ goal line than both the ball and the second-last opponent. 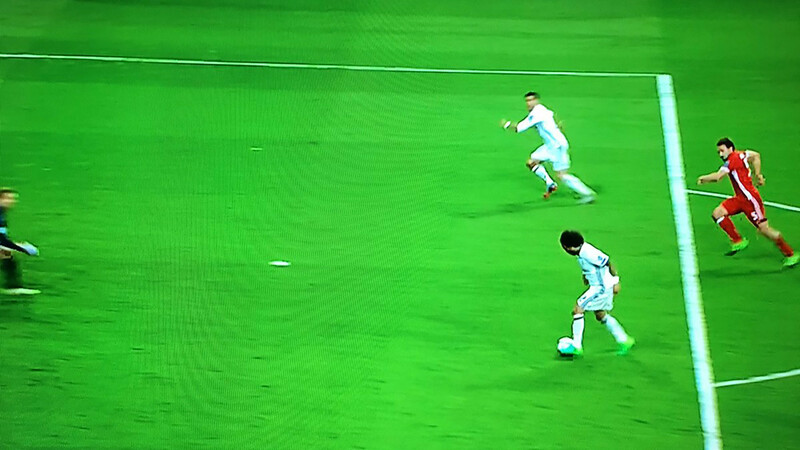 It's obvious that Ronaldo was nearer to the goal line than the the second-last opponent (the guy in the red shirt: Mats Hummels). 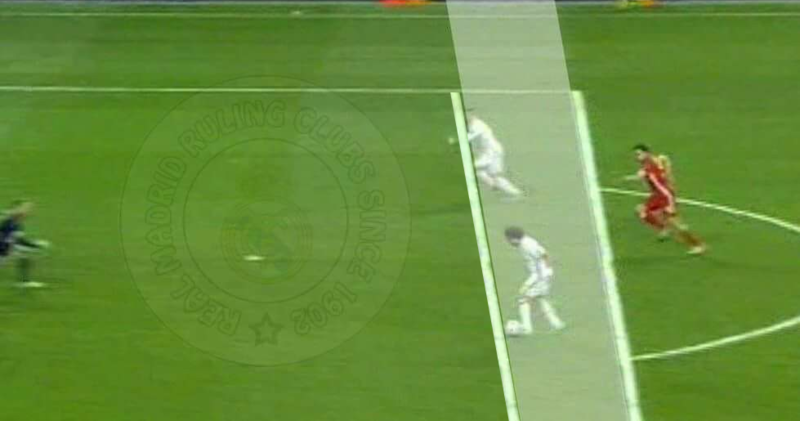 Now the dubious part is whether Ronaldo was nearer to the goal line than the ball. The answer is yes, he was, hence, he was in the offside position. But some of the complexities to the details make it appear close enough that I'm not sure all impartial arbitrators would agree that is a clear-cut offside call, in particular using this picture. If you look closely, you'll note the increasing green between the previously drawn line and the shifted penalty box line I overlaid as you go up the image. Of course the resolution of that image isn't great, making it all that much more challenging to perfectly diagnose the line. Perspective depends upon the distance, height, and lens shape on the camera. That picture of the American football field seems setup to exaggerate it. But the result is that, unless the camera is situated on the line of interest (or a continuation of that line), or is directly above/below that line, any camera view can be surprisingly dubious (I've seen so many times where two views from similar locations appear to show different things due to very slight changes in perspective). The fact that the top and side of the penalty box do not make near a 90 degree angle makes me more suspect there is quite a bit of perspective in this picture, though the camera location would need to be known to have more clarity on this. Also note, the perspective can actually converge in either direction due to the shape of the camera lens (and angle of the camera? ), so the American football field image doesn't necessarily help determine the proper perspective changes either. Now, there is the possibility that perhaps the line shown in the image was actually provided by the broadcasters themselves, and that they calculate it based upon the actual geometry of the camera similar to the NFL's 1st and 10 line. That would make it a lot more reliable. I've still seen such systems be imperfect, but it would allow a little more assurance that it is fairly correct, if we knew that they did that. 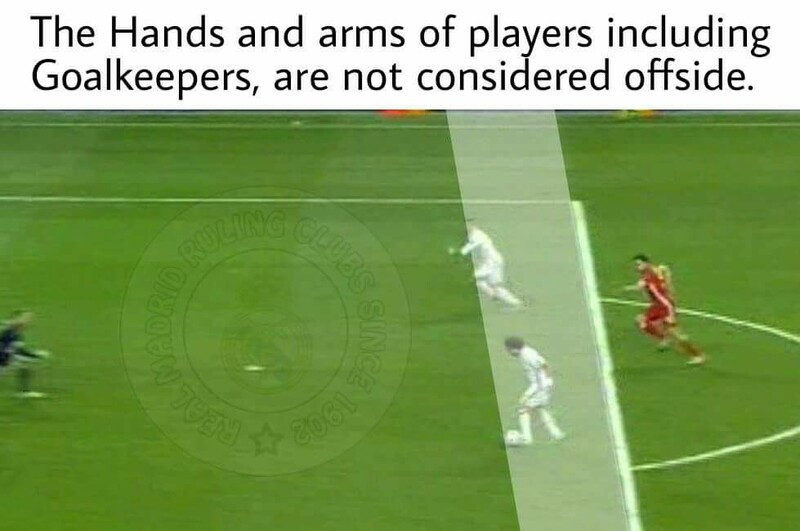 With the trend towards replay officials in soccer, it would seem very important to be able to overlay a properly calculated line reliably onto cameras, taking into account all camera details. Here's to hoping they do that and make clear they are doing that. That challenge of camera perspective, plus the added difficulty in determining the exact moment the ball left his foot, leads me to suggest it may be too close to say for sure. In American football we face so many situations in our replay system where things are unclear or debatable that we require so-called "indisputable visual evidence" to make a call. Now what exactly that is... becomes a question in itself! But from my impartial perspective regarding the game (which I didn't see) (and for what it's worth, with that slight background in geometry and a bit of collegiate intramural refereeing experience) I would only suggest that Bayern fans would perhaps be best off not feeling particularly hard done by such a call, as it is quite close... and there continue to be many worse calls made and allowed to stand. Not the answer you're looking for? Browse other questions tagged rules football officiating champions-league or ask your own question. How much evidence has to be there to overturn an American football play? What happens when fouled behind the goal line near the penalty area? Leroy Sané goal vs Liverpool rebounded off Milner so was offside the correct decision?